UPDATE 2 – The majestic, incomparable Rosa, stained glass window, survived!! The Rosa, stained glass window, contains glass panes no one on earth knows how to make anymore. Here are details of the South Rosa, stained glass masterpiece that was donated by Saint King Louis IX as a gift to compliment the North Rosa window! The South Rose Window symbolises Christ triumphant, reigning over Heaven, surrounded by all his witnesses on earth. It has eighty-four panes divided into four circles. The first one has twelve medallions and the second has twenty-four. A third circle is made up of quadrilobes, and the fourth circle has twenty-four trilobes medallions. This window features the symbolic number four, along with its multiples, twelve and twenty-four. The exquisite details have been altered since the original was removed in 1861 for repairs and reinstalled in this new order. No one knows what order the panes were arranged in originally. The South Rosa, Stained glass window at Notre Dame Cathedral. To understand the delicate balance between beauty and structural strength, architects in the 12th century had to devise ways to use stone and glass to hold up massive arches that held tons of rock up as ceilings. This research paper from Georgetown U. has a great description of the process. That glass could pierce a wall supporting tons of stone is a quintessentially Gothic architectural feat accomplished by traversing apertures with visually delicate but structurally strong webs of stone that break the glass into smaller shapes in a symmetrical way, distributing weight equally across the perforated wall, creating the impression of a curtain of light.Notre Dame’s north transept wall, consisting of a rose window surmounting 18 lancet windows, was built ca. 1250-1260 while Jean de Chelles was architect.Most of the original 13th C. glasswork is still intact, filtering light into a rainbow of blues, reds, greens, browns and yellows. The wide of spectrum of colors achieved in Medieval France’s stained glass windows was produced by varying both the proportion of metal added to molten glass and the temperature to which the mixture was heated. Impurities in the metals, bubbles in the cooled glass and variations in the thickness of the cut panes would ultimately contribute to the jewel-like quality of finished windows. Colored glass was cut to size by heating or with a diamond. Details (facial features, drapery, foliage, etc.) were painted on with a mix of cullet (scrap glass), copper and Greek sapphire dissolved in wine or urine. This ‘glass painting’ was baked again, stimulating further chemical reactions that yielded visually interesting results.In the center oculus of the north rose window is the image of Mary enthroned holding the Christ Child. Surrounding them are images of kings and prophets of the Old Testament. UPDATE 2A – From The Daily Mail comes confirmation that it was a French priest who saved the Holy relic of The Crown of Thorns! Note that The Mail also accurately reports something else that was saved. A French priest who helped the wounded in the Bataclan terror attack on Paris and who survived an ambush in Afghanistan also emerged as a hero of the Notre Dame fire today. Jean-Marc Fournier, chaplain of the Paris Fire Brigade, rushed straight for the relics housed in the cathedral to rescue the the Blessed Sacrament and the Crown of Thorns relics from the blazing building on Monday night. They note he saved The Blessed Sacrament and even used capital letters correctly, Deo Gratia! Below is the view that greeted French fire fighters when they opened the door of the Cathedral yesterday evening, note the Altar and Crucifix have a natural glow; Our Lord shines on Holy Monday! 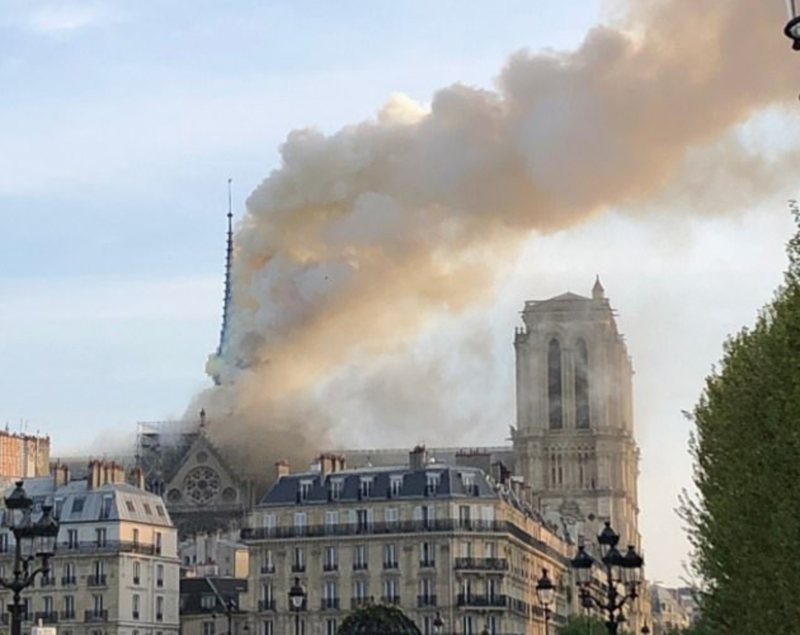 UPDATE – French fire fighters say that they have saved the structure of Notre Dame Cathedral while architects the world over debate whether the roof can ever be rebuilt and to what standards? I ask the pertinent question on Twitter. The first notice of the fire broke on the Mike Church Show while Mike was interviewing C. Joseph Doyle of the Massachusetts Catholic Action League. When the news broke, this is the first image we saw of the fire. 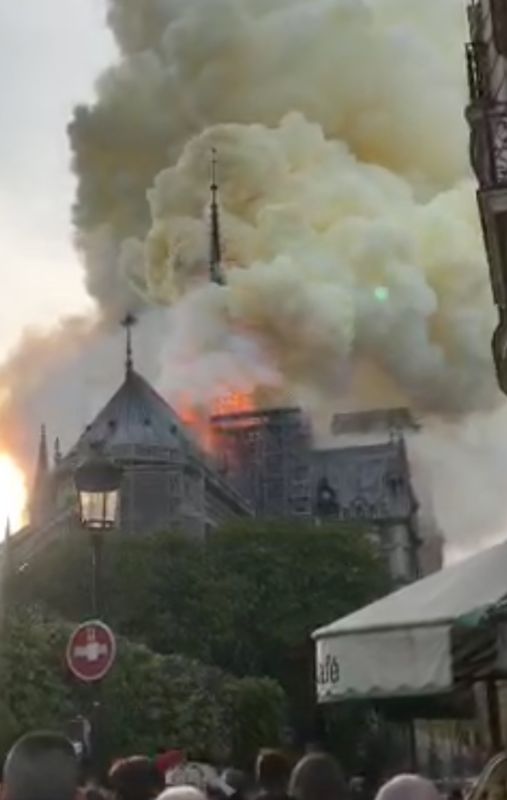 The smoke has just started billowing out of Notre Dame Cathedral, note the fire is nearly in the perfect middle of the structure. During the course of the tragedy, we were reminded that Catholic church’s across France had been recent victims of attacks by muslims and antifa whackos. 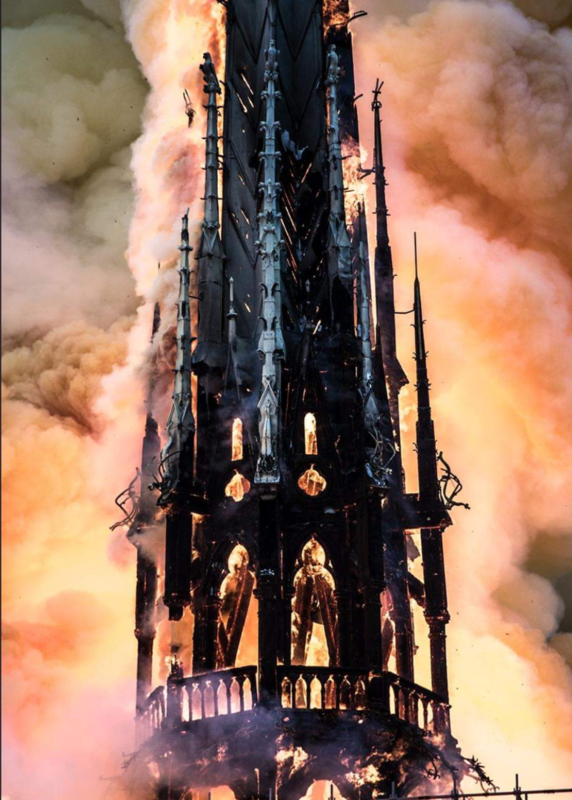 The massive, center spire that soared 315 feet above the ground, is burned beyond recognition. From The Barrett Brief: There is good news coming out of Paris, for the first time tonight. A French firefighting official has told Reuters that we can now say that the structure has been saved from “total destruction”. And a French interior minister says that while another three or four hours are needed to contain the fire, they are feeling more optimistic than they had been a few hours ago. Robert Cardinal Sarah offers encouragement to Marians everywhere. Still early on in the blaze, the flames are now rising along with the smoke. The color of smoke suggests that the minerals contained in older oil paintings are on fire. 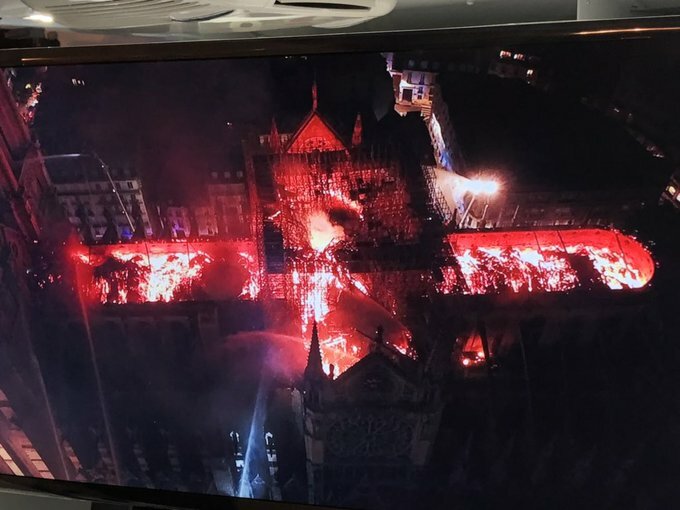 The French authorities recorded this drone image which we earlier thought, showed the nearly complete destruction of the interior of Notre Dame but if you look closely you can see the outlines of the interior, stone ceiling that exists just below the ancient wooden roof line.